What does the possible Border Wall mean for the ecosystem? The debate about the possible building of the border wall has been very tense since the election of President Trump, but a frequently overlooked problem is the effect that this may have to the ecosystem around the building site. The wall itself will separate the migration of some animals that would usually cross between the two countries without a problem. This will make food resources scarce for animals like jaguars, ocelots, and the Mexican gray wolf, and with these animals already struggling population-wise, the border wall could further these animal’s risk of extinction. 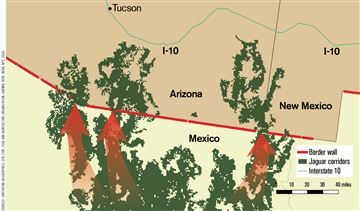 The wall would break up naturally formed habitats for these animals who have been essential in maintaining the food chain in an ecosystem that existed before humans drew a border through it. According to a 2016 analysis of data from the U.S. Fish and Wildlife Service, “More than 100 animals that are listed as threatened, endangered or candidates for such status under the Endangered Species Act from coast to coast could potentially be impacted by Trump’s proposal.” In addition to those mentioned above, among these animals are migratory birds. With the 30 foot wall in place, it will make it difficult for birds to migrate properly which will, in turn, affect the reproduction of the birds that are in the vicinity and may lead to more endangered animals, further weakening the ecosystems that we all depend on for our wellbeing. According to Vox, “The new sections of fence under contract are slated for the Lower Rio Grande Valley of Texas and will cut right through a federal wildlife refuge, a state park, Native American gravesites, and the National Butterfly Center. Conservationists and wildlife managers consider this region to be one of the most ecologically valuable areas on the border.” With the blatant disregard of those who reside there – humans, ancestors, and animals – it is important that this is talked about at least in our community if it is not going to recognized by the President. However, to make a change that is generational it first has to be acknowledged by our President. This barrier will prevent animals from accessing food and water, disrupt migration and reproduction, and change the way animals interact with each other, forcing adaptation to survive. Adaptation is a consistent part of life for human and nonhuman inhabitants of this planet, but we have the power to make decisions that support life rather than force a fight for survival. A Sippy Cup Crisis On Campus? A hot topic that I feel like I’ve been hearing a lot about is how to best combat the use of plastic straws. A while ago, our very own Einstein’s on-campus made a step to take part in Augsburg University’s sustainability commitment by using compostable straws, but many people noted not knowing where the straws should go when tossing their waste. Recently, Einsteins changed from spendy compostable straws to a more “Sippy cup” method, as I’ve heard some call it, as well as paper straws. The smoothies are drinkable without letting it melt first… but it definitely takes extra effort! I agree that Einstein’s is doing a good job at becoming more sustainable and supporting Augsburg University’s commitment to sustainability. However, the quick change allowed for some messiness to come through. Sustainability is complex, and often solutions are not one-size-fits all (or one-lid-fits-all). 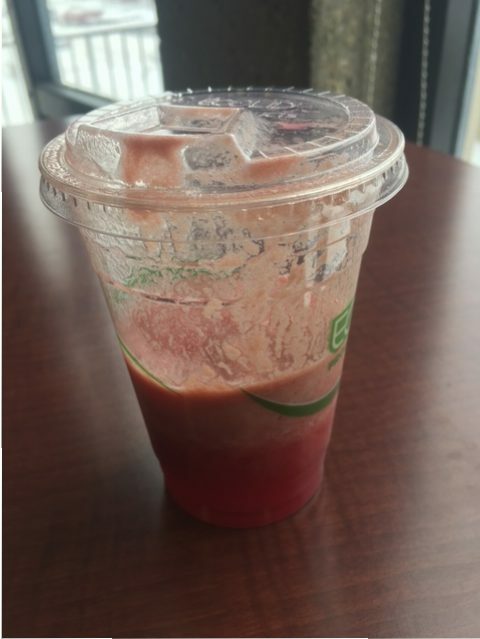 Is there a way to reduce waste and still be able to drink smoothies without having to let them melt or having the straw falling apart? If these things change, I believe people will have a more positive response and be willing to support sustainability efforts. Changing behaviors and habits and preferences can be slow and frustrating, and a positive response to change doesn’t happen easily. We’re adaptable creatures, though, and the urgency of our sustainability problems may require us to keep adapting and trying new things quickly! The polar vortex that happened in the Midwest has been in our daily conversation. It was not something expected or want to experience again! A polar vortex is “A low pressure area—a wide expanse of swirling cold air—that is parked in polar regions. During winter, the polar vortex at the North Pole expands, sending cold air southward. This happens fairly regularly and is often associated with outbreaks of cold temperatures in the United States.” This was interesting to me because even though it is frequent, it’s just the first time I remember it’s been talked about so frequently. For me, the polar vortex emphasized the importance of community when it comes to unexpected environmental experiences. During this time across my social media people were communicating to others where to find shelter if needed, how to get to places, as well as offering supplies. This kind of community allows for people to be aware of the different organizations that they can go to if they need help. The bond and conversation that is in place when times like these happen would be even more effective year round and over various topics. The use of technology plays a big part when it comes to storms that may occur because it allows for a larger sense of community, as well as an exchange of goods and materials. Resilience is fundamental to the sustainability of a city, and I saw this through Facebook during the polar vortex. Being a part of various pages on the social media, I saw people asking for towing services, heating services, or just sharing with others where to get these resources if needed. Resilience is also important to those who may be secluded or an elder in the community. These are the people who are more likely to be harmed by the storm because of their lack of communication with others. By allowing for different circuits of communication open, it’ll prevent tragedies from happening with these people showing social sustainability. Sustainability has different realms, can be hard to define, and may be seen as scary to face. It can be showcased in various ways and I’m confident that when another polar vortex or snow storms happens, the Minneapolis community will not hesitate to help the people within it. Reading:Whats the Deal with Fair Trade? 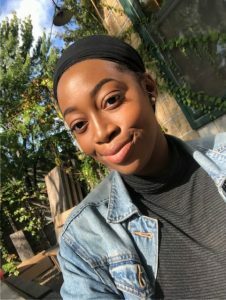 This semester, Environmental Stewardship Education and Outreach Coordinator, Briana Mitchell, will be blogging about her experience with sustainability, choosing topics that have come up this year that warrant more research. She kicks off her blog series with a reflection on what this internship has meant for her and what she’s learned about composting from 1:1 conversations with students. Interested in the Environmental Stewardship Internships? Email environmentalstewardship@augsburg.edu to learn more! This experience as an Environmental Stewardship Intern was something that I did not expect. I did not expect to get so close to my fellow interns, I did not expect to learn so much about composting, and I did not expect to learn how hard it is to define sustainability! I think that it is important for people to have an internship experience because it will give you a chance to explore different possible job occupations, as well as acknowledging your strengths and weaknesses. This internship really made me question what it meant to be a leader. I’m familiar with being a leader and have no problem doing so – my minor is Leadership Studies! However, I’ve been accustomed in other positions to receive a list of things to do when I got in with no chance of creativity. With this position my supervisor gave me three possible options for projects that I could work on throughout the semester. After selecting a project, I was able to work on it and adapt it to a way that showcased my skills. The project I chose was understanding the knowledge people had about composting and sustainability then coming up with a way to show my findings. With this, I was put into a position where I had all creative freedom, something that I was not used to, and I realized I had to adapt my meaning of leadership to best fit my position. Something that helped me achieve this is placing bigger-picture meaning into my internship as well as the projects that I do. By doing this I was able to see and execute sustainability within my life and others. This work was very meaningful to me because this was my first internship and I feel like I accomplished a lot that I’m proud of. I created something with the knowledge I got from my research methods class and was able to be creative about how I went about it. This was the first time I was able to be truly independent and I realized I enjoy independent work and maybe was too dependent on supervisors for guidance. I was aware of sustainability but didn’t know how to define it. Sustainability is different for everyone, and although it’s hard to describe, I came to truly understand its importance. I decided to push myself as well as my roommates to compost in our home and help them understand what should be in what bin. Through this internship I realized the amount of work that goes into composting correctly, and that while it is a difficult thing to understand, it takes little effort to actually do. Internships are a great way to learn about your abilities and what occupations could possibly maximize these abilities. Overall, this experience allowed me to create relationships and understand a lot more about my strengths and weaknesses. I learned to take leadership on projects through critical thinking and brainstorming which is something I was not used to doing. After selecting a project I was able to work on it and adapt it to a way that showcased my skills. The project I chose was understanding the knowledge people had about composting and sustainability then coming up with a way to show my findings. To gather the information, I thought about either choosing a survey or doing one-on-one relational meetings. I decided to choose one-on-one relational meetings because they’re more personable and I wanted more detailed answers as to their understanding of composting and sustainability. With these interviews I met with people for about 45 minutes, which allowed me to get background knowledge about what they see is sustainability, as well as how sustainability shows up in their lives in relation to Augsburg. I focused on five commuters and five people who live on campus, the drawback I found from one-on-one relational meetings is that you can’t do copious amounts by yourself in a short period of time. It’s also extremely difficult to get a time that works for yourself as well as other people, because to get the full effect of a relational meeting you should be communicating for about 45 minutes. From the information I gathered I was able to create a pamphlet that showed the information that I gathered. This is a project that I did independently and gathered the information independently as well which I was not used to. With previous position I was used to waiting on individuals so I can finish my part of a project and had to constantly work interdependently on others. Through these one-on-one relational meetings with students on and off campus it allowed me to create connections that I would not have done otherwise. With this pamphlet I wanted to make it simple enough to have it understandable. 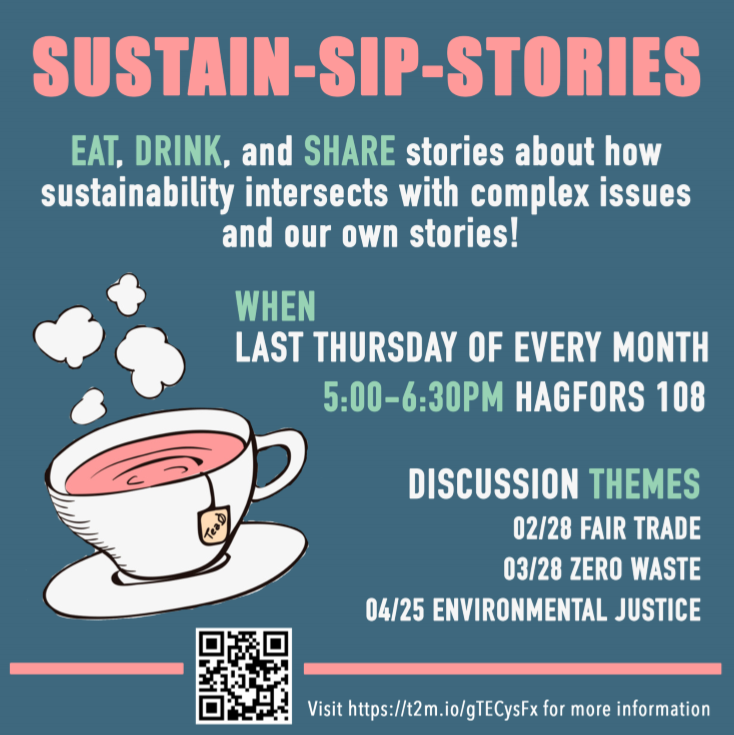 With this information I hope that it will help those within my department as well as those within other departments have an understanding as to what students see sustainability/composting as and its significance. What does it mean to have access to clean tap water on demand? Fresh fruits and vegetables in any season? A park where we see people who look like us? Christina Erickson, Associate Professor of Social Work and Environmental Studies at Augsburg University, has explored and modeled this with students in the Environmental Justice and Social Change course and also in her book, Environmental Justice as Social Work Practice. While environmental justice as an academic field and grassroots movement becomes increasingly more active and urgent in changing inequitable systems and their symptoms, Erickson reminds us, “All of us can reflect on our own experiences and contributions to these systems to begin to imagine the possibilities of change.” Read more in her recent blog: Teaching environmental privilege is integral to environmental justice. 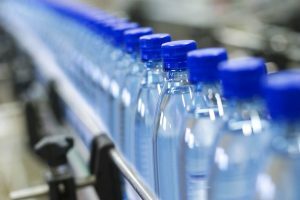 In May 2017, Augsburg approved a new Policy on Bottled Water that aims to reduce waste and greenhouse gas emissions and support the provision of water as a human right and not a commodity. To support policy implementation as we #LoveLocalWater, Fall 2017 Environmental Connections (ENV 100) students created projects to address knowledge gaps, resource needs, and communications opportunities. Check back each week in January as we feature a blog series on different aspects of bottled water written by one of those project groups! Augsburg is not alone in its quest to limit water bottle consumption. Many other institutions have been trying to reach the same goal, but with different methods and varying degrees of success. As we look at these other schools’ attempts, we can highlight the nuances of this issue in order to help us find a more a comprehensive solution to the water bottle issue. Some universities have opted to take a more gradual route in promoting tap water usage. The University of Nevada introduced a price increase of five cents for the sale of plastic water bottles, with the purpose of raising funds for new filling stations across the campus. 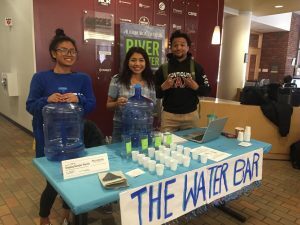 And according to the university, “over $1,400 has been accumulated, the first hydration station has been purchased and installed in the Dining Commons, and another will be installed soon.” This is less environmentally-conscious than completely phasing out plastic water bottles, but it does create funds for the university and incentivizes tap water usage two-fold, through the price increase and installation of new filling stations. While an outright ban of plastic water bottles is preferable within the scope of sustainability, it does come with risks. A group at the University of Vermont did a study on the effect of banning water bottled water from its campus. Rather than look at increases in tap water usage, the group took a look at the other kinds of drinks that students were buying instead of the bottled water. And unfortunately, according to the study, “per capita shipments of bottles, calories, sugars, and added sugars increased significantly when bottled water was removed.” It’s important to take into account how the vending machines will be used if bottled water is removed from them, and the University of Vermont shows us that a water bottle ban alone may lead to some unintended consequences. People often buy water bottles out of convenience, and if they are not present, then might opt for something less healthy (albeit just as convenient). Tackling the water bottle problem must include discouraging the sale of unhealthy drinks. However, the University of Washington in St. Louis has banned the sale of water bottles, while still managing to keep the sale of unhealthy drinks in check. In fact, according to an article in The Source (the University’s center for news), “soda fountain sales have also dropped during that timespan.” It’s important to note here that the university did not simply ban water bottles, but also implemented new filling stations and improved many of their current water fountains. But a more important thing to highlight is that the university also “supports a number of initiatives that promote good nutrition.” Augsburg has already implemented new filling stations, and is well on its way to getting rid of the sustainability nightmare that is plastic water bottles. However, we may need to take a page from the two aforementioned universities, consider the other impacts of removing bottled water, and address those accordingly. Promoting healthier beverages may be a step in the right direction. There are many ways to deter students from purchasing plastic water bottles, but clearly banning them is the most impactful method, in terms of sustainability and the environment. Water bottle production and waste is very damaging, and banning them is only way to send that message. The ban comes with risks, of course, but it’s important to tackle one issue at a time. And with such an abundance of water here in Minnesota, there is no good reason to continue allowing the sale of plastic water bottles. Education is essential to any successful sustainability initiative. Thanks ENV100 students for your contributions! When you think of clean drinking water, you may not think of it as a social issue. But the availability of clean drinking water is very much a social issue. Places all over the globe lack clean water, even places as close as Flint, Michigan. However, some places don’t even have the infrastructure to access clean water to begin with. There are areas where people have to walk miles to drink dirty water. This leads to disease and a life revolving around water. With areas where water is so difficult to come by, you wonder how it’s become such a widely sold product in other areas. The water bottle industry grows by 8-10% each year, which is much higher than many other beverages. The US has access to many lakes and rivers to get our drinking water. However, many industries threaten the purity of the water. Oil fracking companies threaten surrounding bodies of water with chemicals that could largely pollute the water, and oil pipelines cross major aquifers and bodies of water, threatening leaks and contamination. 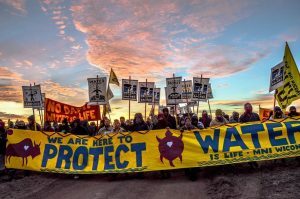 As we saw with Standing Rock and other pipeline activism, people are willing to protect the water that sustains them by risking their lives. For a country that mostly has readily accessible water right in our homes, we sure do buy a lot of bottled water. I and many others can walk down the hall and get as much clean water as we please from the tap, and yet we buy bottled water. Places that don’t have access to this clean drinking water should be the ones with access to the commodity that is bottled water. However, in light of convenience and revenue combined with lack of knowledge, many people who don’t need bottled water buy it anyways. Below is a chart of how much bottled water is consumed in different countries. Bottled Water Consumption in ten Countries, 1999 compared to 2004. 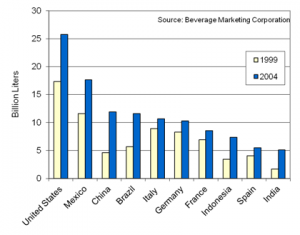 In this chart it is shown that the US had the largest bottled water consumption. The lowest on the chart is India even though they themselves have water quality issues. In India 163 Million people lack access to safe water. One large water supply in India is the Ganges River. It is very polluted with garbage and waste. It makes the bottled water use seem very backwards. A place like the US, where 99% of people have access to clean, safe, cheap drinking water, is the largest consumer of it. “Studies suggest that Americans with income of $60,000 or more are 35% more likely to purchase bottled water. However, even though Black, Hispanic, and Asian household’ income are generally less than average, these groups are more likely to purchase bottled water”. This is an intriguing trend with complex ties to poverty, marketing, infrastructure, and background. As I’ve learned in school, some people have backgrounds and experiences that cause them to believe that bottled water is cleaner and tap isn’t to be trusted. Depending on where and how someone grew up, they may only trust the bottled water. When there is a lack in knowledge of one’s drinking water, it can be confusing. In Minneapolis, we are lucky to have clean drinking water straight from our taps. This makes bottled water unnecessary. However, some people who aren’t used to having access to clean water or have false assumptions about tap water still rely upon it. Some people may be unaware that our drinking water is safe and just as clean as bottled water. But the lack of knowledge isn’t the only reason people buy bottled water. Many times it’s bought for its convenience. Many like to live without burden and to have faster lifestyles. Buying bottled water takes out the time of needing to fill reusable water bottles or remember to bring your own. You may not even be able to fill your bottle in certain places if water fountains aren’t available. Or you may not have your own bottle to bring. But what about when we get to larger scale bottled water use and sales outside of our homes? There are major events and buildings that still rely heavily on bottled water, such as for sporting events and concerts. The sports teams and venues may even rely on the revenue of these sales. Although they may rely on it’s sale, I feel it’s important to encourage people to bring reusable water bottles for these events. If venues would be heavily affected by reusable water bottle use, then they could turn to selling reusable water bottles and try to offer a place to fill them. This way they can still get their revenue while being environmentally conscious. The sale of reusable water bottles also gives convenience to those who may not have one yet, or have forgotten theirs. With all this talk about bottled water it brings up the question of what happens to the bottles after they’re used. Do they get recycled? If people don’t recycle, what’s preventing them from doing so? It seems that around 32 percent of water bottles are currently recycled. This number, however, is rising gladly. But even though the water bottles are recycled, they’re generally not fully recycled. Many newly made water bottles are only partly made from recycled materials. The bottles that aren’t recycled end up in landfills or the environment. Many bottles are also exported to plastic manufacturers and turned into things like clothing, carpets and packaging. This means every bottle is using newly made plastic and not fully recycled plastic. In an Upworthy article I read there are many reasons as to why someone doesn’t recycle at all. The main reason people gave is that there isn’t a recycling bin easily accessible. If they don’t have a place to put the recyclables I can see how it could become difficult. Other reasons include forgetfulness and how time consuming it is. This falls under the convenience factor. People buy the plastics in thought of convenience and use the same excuse when asked about recycling it. I also noticed the lack of education come up as an excuse. If a person is unaware what they are allowed to recycle they are less likely to do so. All of these trends bring up questions to think about in terms of who benefits from bottled water, who is harmed by its bottling and disposal, and how it’s more than just the plastic to be concerned about when thinking about bottled water. At a glance, bottled water seems convenient and harmless. However, when looking at the issue of bottled water from an environmental standpoint, it becomes quite complex. That is because you must consider where the plastic comes from to make the bottles, what happens to the plastic bottles after the water inside has been consumed, and where does the water actually come from? I will be focusing mostly on the impacts of the plastic and the water itself. 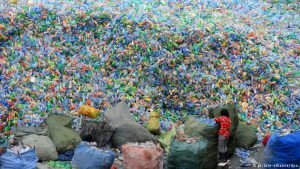 This statistic is shocking, but you may be saying, “Well I recycle all of mine, so what’s the problem?” Peter Gleick went on to explain that instead of taking recycled plastic bottles to make new bottles, America’s recycled plastic usually gets sent to China. Here it is used to make fabric, rugs and clothing. So this plastic is getting “down-cycled” instead of recycled. This means that in order to make more bottles, they need more crude oil, the source of raw material to create plastic. Oil extraction releases greenhouse gases that are a leading causing of climate change, and plastics production releases additional toxics into the environment. In addition to those harms, bottled water usually isn’t a local enterprise. According to the article “Life Cycle of a Plastic Water Bottle” in some cases of transporting bottled water, it can take more than a liter of gasoline per bottle. According to the article “How Much Energy Goes into Making a Bottle of Water” producing and transporting bottled water uses up to 2,000 times the energy required to produce and distribute tap water. It is also estimated that approximately one in four bottles of water crosses at least one international border in route to its final destination. In addition to the plastic from the bottles themselves being harmful to the environment, the water itself can cause harm. 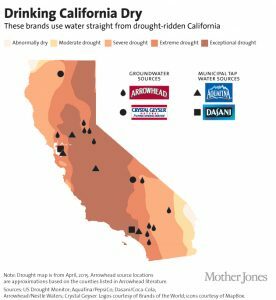 Bottled water, which you might recall isn’t all that special (see our previous post about the health and safety of bottled water), is taking water from places that are running dry. For example, there are a variety of companies that bottle water in California, a state that is terrorized by drought. Although many companies bottle water from municipal sources, some actually do bottle spring water. But the springs often can’t support the amount of water being taken from them, and at times, even dry up. An article called “‘Not one Drop’ of Polish Spring bottled water is from a Spring, Lawsuit claims” quotes “the famous Poland Spring in Poland Spring, Maine, which defendant’s labels claim is a source of Poland Spring Water, ran dry nearly 50 years ago.” Even though bottled water companies are distributing drinking water, it can drain sources that local communities rely on. After learning about all of the ways that plastic water bottles negatively impact the environment, I’ve decided to stop buying them all together. It is important to understand that there are some communities, and certain circumstances where bottled water is necessary. Examples include areas impacted by natural disasters or towns where their tap water is unsafe. But here in the city of Minneapolis, where we are blessed with great tap water, it just isn’t logical to go with plastic bottles. It’s also much more economical to purchase one reusable water bottle, that you can fill an infinite number of times, than to continue to purchase plastic bottles. I believe that every individual has the ability to make a difference! Some of these environmental problems that we are facing seem too daunting to solve. But don’t let this fear stop you from doing what you can to help solve these problems! Everyone has the power to make a difference! By purchasing less plastic water bottles, we can limit the amount of plastic getting tossed into landfills and down-cycled. In addition to that, if less people are buying plastic water bottles, then less petroleum will need to be extracted from the ground to make new bottles. All of these benefits for our environment come from a choice you the consumer get to make. The facts are staggering, and bottled water in most circumstances doesn’t make sense the more you think about it. So the next time you want to quench your thirst, try water from your tap – the environment will thank you. Many people often wonder what the difference is between bottled water and tap water. It is often that they conclude that bottled water is the healthier and safer option, since the companies selling their product claim so after all. These companies give the idea that tap water is dirty and that their own bottled water is healthier and cleaner. But is it true that tap water is that unsafe? Although many companies claim that their bottled water is from mystical springs, the truth is that often they aren’t so. 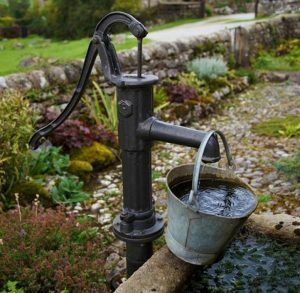 Most companies get their water from normal ordinary wells and underground sources one might expect from tap water. In fact it is estimated that 25% of all bottled water is just repackaged tap water, often not even further tested. After the water is acquired it goes through the same regulations and testing as tap water. In fact the Food and Drug Association (FDA) adopts similar regulations for bottled water that the Environmental Protection Agency (EPA) already uses for tap water. So in essence both bottled water and tap water are of the same safety and quality, and tap water is usually tested and monitored for safety more often than bottled water. The EPA does not regulate private wells, so water from there must be privately tested, and water can become contaminated in old pipes connecting to buildings, as we’ve seen in Flint, Michigan. So while there could be cases where bottled water is safer for individuals to drink, the majority of people in the U.S. with access to tap water have a clean, safe source of water already at hand. If you live in a city with public water systems, drinking tap water may be economically beneficial to you compared to buying bottled water. The average cost of a gallon of water in a bottle is $1.22, which is 300,000% more than if you used a gallon of tap water. Because tap water is essentially the same quality, why should we pay extra for the same product?